If you were to ask a plumber about the types of jobs in plumbing that he likes the most, the answer would probably be, “the most profitable ones”. This would be a normal answer, as everyone would like to earn the maximum amount of money during their working day. 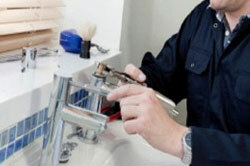 The question is which are the most profitable types of jobs in plumbing? And what skills do you need or services do you need to offer to earn top rates of pay? An “ask an expert service” is one of the best ways that you can actually find clients who are looking for the types of jobs in plumbing that you, as a plumber, can make a profit from. This does not mean that you exploit those visitors to your website or callers to your call center who are looking for advice. Rather, if you can help them match their own skills with the plumbing job that they need to carry out, you will be considered a trustworthy consultant who helps them to avoid unnecessary plumbers’ bills. If, on the other hand, they feel that they do not have the skills and capability to do the job themselves, they will most probably turn to you to ask if you can help get the job done. You have earned their trust and so it will be no problem to work out a service call. What are the most profitable types of jobs in plumbing? Working on new construction building, it’s easy to plan and there is no disruption because of inhabitants. Home maintenance, but this can work both ways and sometimes a job is more complex than that quoted for. Emergency call services, nobody haggles over the rates when the water is pouring from the ceiling at 3am in the morning. Working on home or business construction is one of the best types of jobs in plumbing. The reason for this is that the work can be planned in advance. This means the right number of plumbers under the master plumber can be gathered for the construction team and they will be working for the whole business day without the need to move from location to location. This is cost-effective, as travel time is not normally paid for. In addition, if payment is only made based on the number of installations carried out, there is no risk that residents can get in the way of achieving the best results. A plumber should also consider boiler installation seriously. If you are certified to install boilers from a popular manufacturer or to carry out periodic maintenance, the rates that you charge are not based on the hours that you work. Finding a boiler manufacturer who charges a higher fee for the regular maintenance and becoming the certified maintenance engineer of choice can mean that you will get a higher hourly payment than if you were to do this work on an ad hoc basis.